There are times when you are certain that your dog has an emergency (ie: hit by a car) and there are times when you are very concerned but not convinced that it is an emergency requiring immediate care. When in doubt, head to our clinic if it is during office ours. If possible, call on your way to let us know the type of emergency and if you will need assistance getting into the building and your E.T.A. If it is after hours please proceed to the emergency clinic in our area. Do your best to remain calm and have a passenger to hold the dog while you drive. We are staffed and equipped to handle all types of emergencies. Emergencies are very stressful and it is important that you do your best to remain calm. Your dog will be soothed by your ability to remain calm and speak and a calming tone while driving it to the hospital. Some types of situations may concern you, but may not have you convinced your dog needs immediate care. In these cases, it is still best to err on the side of caution. Please call or just come into the clinic. If you decide to call, our staff will do our best to help you decide the best course. Unfortunately, dogs will quite often mask symptoms and it may be difficult to determine the seriousness of the illness. We are here for you and will take care of your dog in the best way possible. If you do not live in Viera, then we urge you to seek out and familiarize yourself with the 24 hour dog hospital in your area. 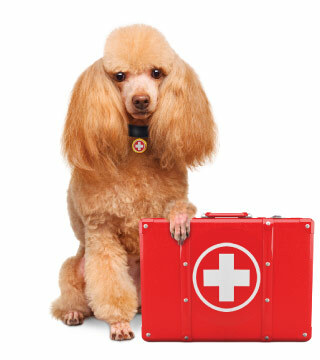 This way, should an emergency arise for your beloved canine companion, you will be prepared to get him or her to an emergency dog clinic immediately instead of wasting valuable time that could result in the worsening of an already tragic situation.